Ascanio (Cuba, 1988) is a painter, streetart muralist, live painter performer and screen printer, now living and working in Milan, Italy. He graduated from the Academy of Fine Arts of Santiago de Cuba with a major in painting and drawing. 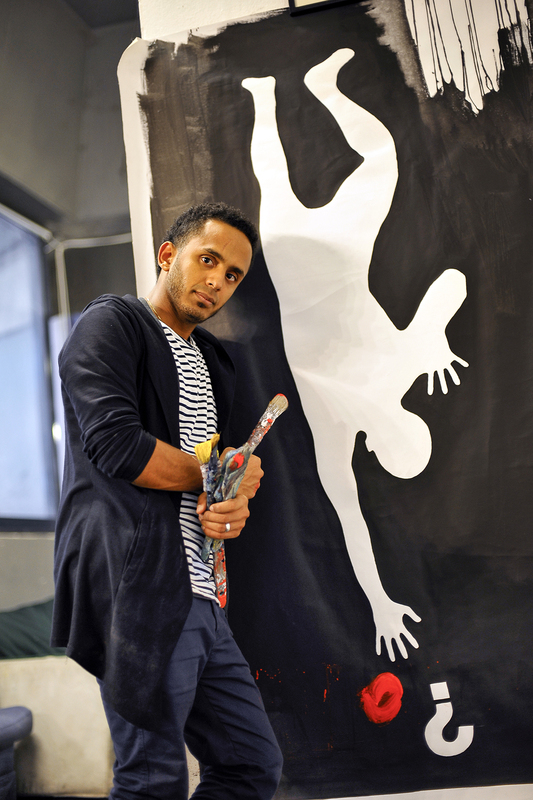 As much as on his on-canvas artworks, screen-printings or walls, Ascanio reproduces his own shape of man leaning forward as a symbol of all contemporary individuals intent on challenging the future and standing out against different life scenarios, a concept which is summarised in his payoff “CLIMBING THE FUTURE“. As a graphic synthesis of his art-motive, this image merges with his own name and becomes his signature of recognition. 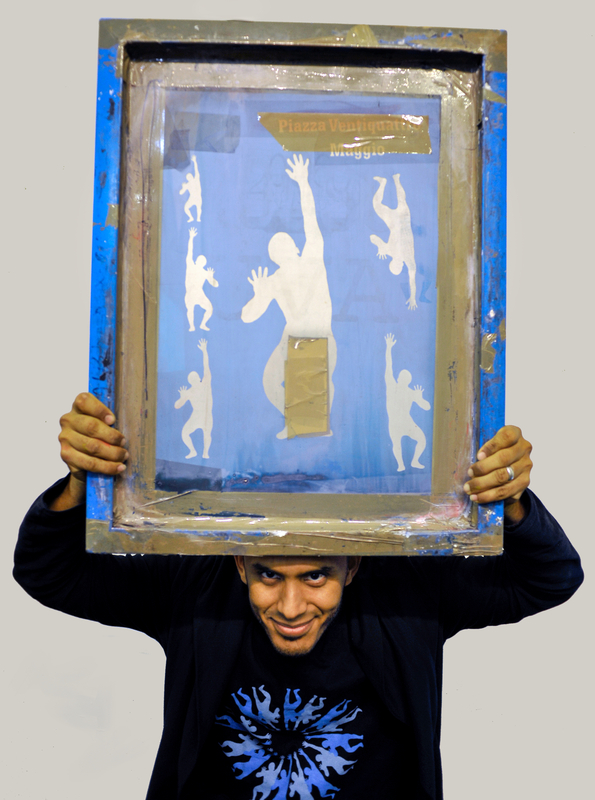 From years of working experience at the “René Portocarrero” screen printing laboratory in Havana, Ascanio finds in the acquired screen-printing technique a great source of artistic inspiration and experimentation that he gradually introduces in his works, giving his artworks a marked and characteristic style. With the exclusive use of brush and traditional mural painting techniques, Ascanio realizes large murals, paying tribute to local personalities and artists as Enzo Jannacci and Morando Morandini, but at the same time giving his contribution to urban redevelopment projects with colourful street art works. Ascanio likes to interact and collaborate with international artists, organizing activities and developing interdisciplinary art projects. He also likes to spontaneously engage eager and interested people in the implementation of his street art works, inviting them to participate and to share a unique participatory art experience. Academy of Fine Arts “José Joaqda”. Major in painting and drawing, until 2007. Santiago de Cuba, Cuba. Professor Augusto Rivero. Maqueta de La Habana, Cuba. [LIVE PAINTING PERFORMANCE] – Milan Design Week 2019, Italy. [BLENDS OF MANY TESTIMONIAL] – Milan, Italy. [PAINTED MURAL] – Milan, Italy. In tribute to Paolo Limiti, for Cineteca Milano. La Biblioteca di Morando. Naviglio Martesana, Via Tofane, 49. [LIVEPAINTING AND SCREEN PRINTING] Lago di Garda / Napoli / Milan. Team building event. [LIVE PAINTING AND SCREEN PRINTING] – Piazza Gae Aulenti, Milano Fuorisalone 2018, Italy. [ART PAINTING WORKSHOP] – Educational activity with the students of Istituto Comprensivo “Console Marcello”, Milan, Italy. [PAINTED MURAL] – Castellammare del Golfo (TP), Italy. In collaboration with Trinart Association. Villa Olivia. In tribute to Morando Morandini, for Cineteca Milano. La Biblioteca di Morando. Naviglio Martesana, Via Tofane, 49. Fuorisalone forniture Show, in collaboration with Artepassante Association. Corso Garibaldi, 49. Project by Artepassante and RFI (Rete Ferroviaria Italiana) on the occasion of the Salone del Mobile forniture Show. Patronage of the Municipality of Milan. Repubblica (MM3) undergroung station entrance. [PRIZE] – Nova Milanese. Milan, Italy. Delivery of on canva artwork N. 1 for the “Artist Book” project. Villa Vertua, Via Garibaldi, 1. [INTERNAL DESIGN] – Milan, Italy. Presentation of the modern bookcase designed by the architect Emanuele Svetti, integrated with a n original artwork oncanva and its reproduction on a light panel. Oncanva artwork and design. BOFFETTO Srl, form-to-furniture. Via Borgogna 5b. [STREET PAINTING] – Milan, Italy. Artistic direction and realization of 50 m2 of sidewalks in 50 key points of the City of Milan. Live performance and #streetpainting combined with the textures of emerging designers from the Accademia del Lusso, School of Fashion and Design. Vogue Fashion Night Out. [PAINTED MURAL] – Petrosino (TP), Sicily, Italy. Streetart promoted by the Municipality of Petrosino. Project aimed at urban policies of environment regeneration, redevelopment and systemisation. [DECORATION] – San Donato Milanese, Milan, Italy. Decoration of the glass facade of the Municipality of San Donato Milanese for the 70° Anniversary of April, 25th Liberation Day – With MisterCaos and SandoCalling. Artepassante Association project. Underpass SS494, Castelletto di Abbiategrasso. Project by the 4th Area Council of Municipality of Milan and MM S.p.A., Forlanini FS railway station. Via Ardigò. [PAINTED BANNER] -Sesto San Giovanni. Milan, Italy. On canvas interpretation of the protest message of the “fight against the electrode” Subcommittee. Un Murale per Parco Adriano! Four painted Murals for a district regeneration project. Direct involvement of children and inhabitants of the area. Comitato Parco Adriano and 2° Area Council of Milan Municipality. Tribute to singer and composer Enzo Jannacci, 4th Area Council of Milan Municipality and MM S.p.A., Stazione Forlanini FS. Via Ardigò. [DECORATION] – Abbiategrasso (MI), Italy. Regeneration of the Grenadiers Park in collaboration with the Municipality. ATA – Atelier del Teatro e delle Arti, Artepassante Association, Repubblica (MM3) underground station. [LIVE PAINTING] – Padova. Italy. Music, art and solidarity against gender violence. Anfiteatro del Venta. Painted 3D EXPO logo for the Rho-Fiera International Expo. Private exhibition and live performance in collaboration with Arteinprogress: Art in unconventional spaces. Legal Office. Via Vincenzo Monti 6, Milan. Exhibition and live performance in collaboration with Arteinprogress, Nhero-Milano lounge bar, Via Felice Casati 44, Milan, Italy. Vogue Fashion Night Out, Accademia del Lusso – Scuola di Moda e Design, Via Montenapolenone 5, Milan, Italy. Milano Latin Festival. Cuba Pavilion, Assago Forum, Milan, Italy. Hostal Los Frailes, Old Havana, Havana, Cuba. Grand Theater of Havana, Havana, Cuba. Boyeros Project Center, Havana, Cuba. Cultural Athenaeum, Santiago de Cuba, Cuba. Permanente Museum. Via F. Turati 34, Milan, Italy. WISH – World International Sicilian Heritage and Rosa Mundi. Italian Capital of Culture 2018. Palermo, Sicily. Artepassante Gallery, Repubblica (MM3) subway station. Itinerant exhibition curated by Giorgio Seveso. House of Memory. Milan, Italy. Bookcity Milano Expo, exhibition and live performance, Rogoredo. Internazional Contest, Fabbrica del Vapore. Cachi pum! Piedra, papel o tijera. Fábrica de Arte Cubano Gallery. La Moderna Gallery, Havana City, Cuba. Bayamo Provincial Center of Plastics Arts. René Portocarrero screen printing Lab. Calle Cuba #513. Havana, Cuba. “René Portocarrero” screen printing Lab.